How to find really new knowledge? How do you find really new science? Not by knowing the result: this is what we don’t have yet. Any really new science will not be deduced from pre-existing science. Any really new knowledge will come out of the blue. Poetical, and, or, emotional logic will help before linear logic does. A top lawyer, admitted to the US Supreme Court, and several countries. told me that the best judges know, emotionally, where they want to go, and then build a logical case for it. The case of Dark Matter is telling: this increasingly irritating elephant in the bathroom has been in evidence for 80 years, lumbering about, smashing the most basic concepts of physics. As the encumbering beast did not fit existing science, it was long religiously ignored by the faithful of the church of standard physics, as a subject not worthy of deep inquiry by very serious physicists. Now Dark Matter, five times more massive than Standard Model matter, is clearly sitting heavily outside of the Standard Model, threatening to crush it into irrelevance. Dark matter obscures the lofty pretense of known physics to explain everything (remember the grandly named TOE, the so-called “Theory Of Everything“? That TOE was a fraud, snake oil, because mainstream physics celebrities crowed about TOE, while knowing perfectly well that Dark Matter dwarfed standard matter, and while being completely outside of the Standard Model). Physicists are presently looking for Dark Matter, knowing what they know, namely that nature has offered them a vast zoo of particles, many of them without rhyme or reason. or symmetries to “explain” (indeed, some have rhyme, a symmetry, a mathematical group such as SU3 acting upon them; symmetries have revealed new particles, sometimes). Bullet Cluster, 100 Million Years Old. Two Galaxies Colliding. The Dark Matter, In Blue, Is Physically Separated From the Hot, Standard Matter Gas, in Red. However, remember: a truly completely new (piece of) science cannot be deduced from pre-existing paradigm. Thus, if Dark Matter was really about finding a new particle type, it would be interesting, but not as interesting as it would be, if it were not, after all, a new particle type, but instead, a consequence from a completely new law in physics. This is the quandary about finding truly completely new science. It can never be deduced from ruling paradigms, and may actually overthrow them. What should then be the method to use? Can Descartes and Sherlock Holmes help? The paradigm presented by Quantum Physics helps. The Quantum looks everywhere in space to find solutions: this is where its (“weird”) nonlocality comes in. Nonlocality is crucial for interference patterns and for finding lowest energy solutions, as in the chlorophyll molecule. This suggests that our minds should go nonlocal too, and we should look outside of a more extensive particle zoo to find what Dark Matter is. In general, searching for new science should be by looking everywhere, not hesitating to possibly contradict what is more traditional than well established. An obvious possibility to explain Dark Matter is, precisely, that Quantum Physics is itself incomplete, and generating Dark Matter, and Dark Energy, in places where said incompleteness (of the present Quantum theory) would be most blatant: large cosmic distances. This would happen if what one should call the “Quantum Interaction” proceeds at a finite speed (much faster than c, by a factor of at least 10^23…). It’s enough. The more one does find a conventional explanation (namely a new type of particle) for Dark Matter, the more likely my style of explanation is likely. How could one demonstrate it? Not by looking for new particles, but by conducting new and more refined experiments in the foundations of Quantum Physics. If this guess is correct, whatever is found askew in the axioms of present Quantum Physics could actually help future Quantum Computer technology (because the latter works with Quantum foundations directly, whereas conventional high energy physics tend to eschew the wave aspects, due to the high frequencies involved). Going on a tangent is what happens when the central, attractive force, is let go. A direct effect of freedom. Free thinking is tangential. We have to learn to produce tangential thinking. René Descartes tried to doubt the truth of all his beliefs to determine which beliefs he could be certain were true. However, at the end of “The Meditations” he hastily conclude that we can distinguish between dream and reality. It is not that simple. The logic found in dreams is all too similar to the logic used by full-grown individuals in society. However unbelievable Quantum Physics, however dream-like it is, physicists believe in it, and don’t question it anymore than cardinals would Jesus. Actually, it’s this dream-like nature which, shared by all, defines the community of physicists. Cartesian doubt, pushed further than Descartes did, will question not just the facts, the allegations, but the logic itself. And even the mood behind it. How sure are we of the Foundations of Quantum Physics? Answer: very sure, all too sure! 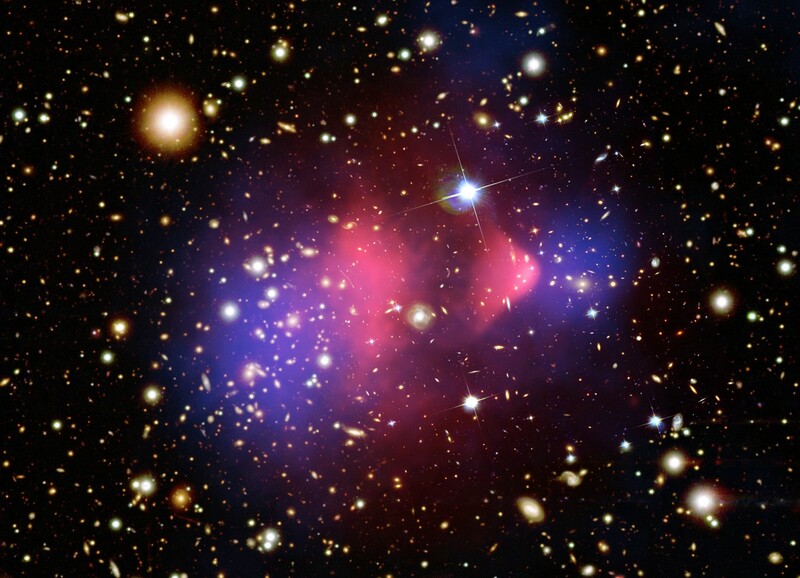 Could not it be that Dark Matter is a cosmic size experiment in the Foundations of Quantum Physics? Physics, properly done, does not just question the nature of nature. Physics, properly done, questions the nature of how we find out the nature of anything. Physics, properly done, even questions the nature of why we feel the way we do. And the way we did. About anything, even poetry. In the end, indeed, even the toughest logic is a form of poetry, hanging out there, justified by its own beauty, and nothing else. Don’t underestimate moods: they call what beauty is. TO BE AND NOT TO BE? Is Entangled Physics Thinking, Or Sinking? Frank Wilczek, a physics Nobel laureate, wrote a first soporific, and then baffling article in Quanta magazine: “Entanglement Made Simple”. Yes, all too simple: it sweeps the difficulties under the rug. After a thorough description of classical entanglement, we are swiftly told at the end, that classical entanglement supports the many World Interpretation of Quantum Mechanics. However, classical entanglement (from various conservation laws) has been known since the seventeenth century. Skeptical founders of Quantum physics (such as Einstein, De Broglie, Schrodinger, Bohm, Bell) knew classical entanglement very well. David Bohm found the Bohm-Aharanov effect, which demonstrated the importance of (nonlocal) potential, John Bell found his inequality which demonstrated, with the help of experiments (Alain Aspect, etc.) that Quantum physics is nonlocal. The point about the cats is that everybody, even maniacs, ought to know that cats are either dead, or alive. Quantum mechanics make the point they can compute things about cats, from their point of view. OK.
Quantum mechanics, in their busy shops, compute with dead and live cats as possible outcomes. No problem. But then does that mean there is a universe, a “world“, with a dead cat, happening, and then one with a live cat, also happening simultaneously? Any serious philosopher, somebody endowed with common sense, the nemesis of a Quantum mechanic, will say no: in a philosopher’s opinion, a cat is either dead, or alive. To be, or not to be. Not to be, and not to be. A Quantum mechanic can compute with dead and live cats, but that does not mean she creates worlds, by simply rearranging her computation, this way, or that. Her various dead and live cats arrangements just mean she has partial knowledge of what she computes with, and that Quantum measurements, even from an excellent mechanic, are just partial, mechanic-dependent measurements. For example, if one measures spin, one needs to orient a machine (a Stern Gerlach device). That’s just a magnetic field going one way, like a big arrow, a big direction. Thus one measures spin in one direction, not another. What’s more surprising is that, later on, thanks to a nonlocal entanglement, one may be able to determine that, at this point in time, the particle had a spin that could be measured, from far away, in another direction. So far, so good: this is like classical mechanics. However, whether or not that measurement at a distance has occurred, roughly simultaneously, and way out of the causality light cone, EFFECTS the first measurement. This is what the famous Bell Inequality means. 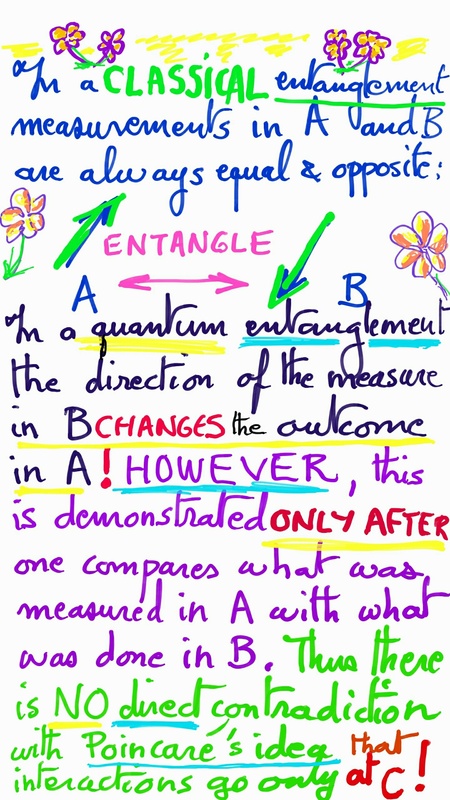 And this is what the problem with Quantum Entanglement is. Quantum Entanglement implies that wilful action somewhere disturbs a measurement beyond the reach of the five known forces. It brings all sorts of questions of a philosophical nature, and make them into burning physical subjects. For example, does the experimenter at a distance have real free will? Calling the world otherworldly, or many worldly, does not really help to understand what is going on. Einstein’s “Spooky Interaction At A Distance” seems a more faithful, honest rendition of reality than supposing that each and any Quantum mechanic in her shop, creates worlds, willy-nilly, each time it strikes her fancy to press a button. What Mr. Wilczek did is what manyworldists and multiversists always do: they jump into their derangement (cats alive AND dead) after saying there is no problem. Details are never revealed. “Everyday language is ill suited to describe quantum complementarity, in part because everyday experience does not encounter it. Practical cats interact with surrounding air molecules, among other things, in very different ways depending on whether they are alive or dead, so in practice the measurement gets made automatically, and the cat gets on with its life (or death). But entangled histories describe q-ons that are, in a real sense, Schrödinger kittens. Their full description requires, at intermediate times, that we take both of two contradictory property-trajectories into account. Sounds impressive, but the reasons are either well-known or then those reasons use a sleight of hand. And now the sleight of hand: …”rather than [gather] partial information spanning several times. But it can be done — indeed, without great technical difficulty.” This nothing new: it is the essence of the double slit discovered by that Medical Doctor and polymath, Young, around 1800 CE: when one runs lots of ‘particles’ through it, one sees the (wave) patterns. This is what Wilczek means by “partial information“. Guess what? We knew that already. Believing that one can be, while not to be, putting that at the foundation of physics, is a new low in thinking. And it impacts the general mood, making it more favorable towards unreason. If anything can be, without being, if anything not happening here, is happening somewhere else, then is not anything permitted? Dostoyevsky had a Russian aristocrat suggests that, if god did not exist anything was permitted. And, come to think of it, the argument was at the core of Christianism. Or more, exactly, of the Christian reign of terror which started in the period 363 CE-381 CE, from the reigns of emperor Jovian to the reign of emperor Theodosius. To prevent anything to be permitted, a god had to enforce the law. What we have now is way worse: the new nihilists (Wilczek and his fellow manyworldists) do not just say that everything is permitted. They say: it does not matter if everything is permitted, or not. It is happening, anyway. Somewhere. Thus Many-Worlds physics endangers, not just the foundations of reason, but the very justification for morality. That is that what is undesirable should be avoided. Even the Nazis agreed with that principle. Many-Worlds physics says it does not matter, because it is happening, anyway. Somewhere, out there. So what is going on, here, at the level of moods? Well, professor Wilczek teaches at Harvard. Harvard professors advised president Yeltsin of Russia, to set up a plutocracy. It ruined Russia. Same professors made a fortune from it, while others were advising president Clinton to do the same, and meanwhile Prime Minister Balladur in France was mightily impressed, and followed this new enlightenment by the Dark Side, as did British leaders, and many others. All these societies were ruined in turn. Harvard was the principal spirit behind the rise of plutocracy, and the engine propelling that rise, was the principle that morality did not matter. because, because, well, Many-Worlds! How does one go from the foundations of physics, to the foundations of plutocracy? Faculty members in the richest, most powerful universities meet in mutual admiration societies known as “faculty clubs” and lots of other I scratch-your-back, you scratch-my-back social occasion they spend much of their time indulging in. So they influence each other, at the very least in the atmospheres of moods they create, and then breathe together. What is time? Quantum Physics gives an answer, classical physics does not. Quantum Physics suggests that time is the set of all irreversible processes. This is a world first, so it requires some explanations. I have been thinking, hard, of these things all my life. Sean Carroll, bless his soul, called my attention to the new development that mainstream physicists are starting to pay attention to my little kingdom(so I thank him). Claim: Quantum Interference Is An Irreversible Process, Time’s Arrows All Over. Quantum Interference Goes From Several Waves, To One Geometry. 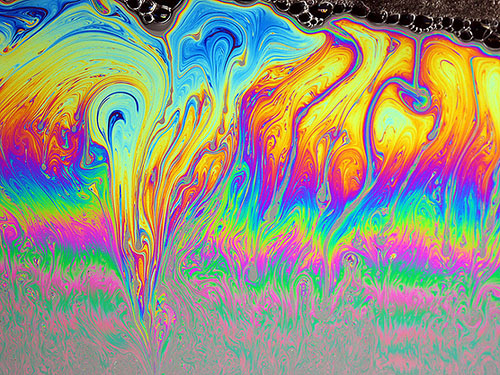 Soap Bubbles Brim With Quantum Interference..
SC: …what are “quantum fluctuations,” anyway? 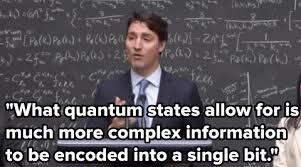 Talk about quantum fluctuations can be vague. There are really 3 different types of fluctuations: Boltzmann, Vacuum, & Measurement. Boltzmann Fluctuations are basically classical: random motions of things lead to unlikely events, even in equilibrium. Patrice Ayme’: Is that really true? Are equations time-symmetric? Not really. First, equations don’t stand alone. Differential equations depend upon initial conditions. Obviously, even if the equations are time-symmetric, the initial conditions are not: the final state cannot be exchanged with the initial state. Quantum Physics make this observation even more important. The generic Quantum set-up depends upon a geometric space S in which the equation(s) of motion will evolve. Take for example the 2-slit: the space one considers generally, S, is the space AFTER the 2-slit. The one before the 2-slit, C, (for coherence) is generally ignored. S is ordered by Quantum interference. 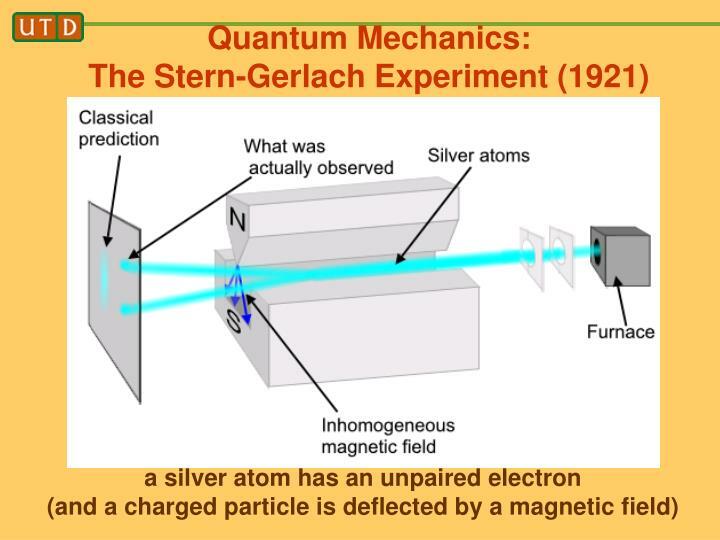 The full situation is made of: (C, S & Quantum interference). it’s not symmetric. The Quantum depends upon the space (it could be a so-called “phase space”) in which it deploys. That makes it time-assymmetric. An example: the Casimir Effect. Indeed. Quantum states are, intrinsically, more spread out. They are NON-LOCAL. Why? One has to go back to the basics. What is Quantum Physics about? Some, mostly the “Copenhagen Interpretation” followers, claim Quantum Physics is a subset of functional analysis. (The famous mathematician Von Neumann, one of the creators of Functional Analysis, was the founder of this system of thought; this scion of plutocrats, famously, yet satanically, claimed that De Broglie and Bohmian mechanics were impossible… Von Neumann had made a logical mistake; maybe that had to do with being involved with the satanic part of the American establishment, as, by then, that Hungarian had migrated to the USA and wanted to be called “Johnny”!). But let’s backtrack. Where does Quantum-as-functional-analysis come from? A Quantum system is made of a (“configuration”) space S and an equation E (which is a Partial Differential Equation). Out of S and E is created a Hilbert Space with a basis, the “eigenstates”. In practice, the eigenstates are fundamental waves. They can be clearly seen, with the mind’s eye, in the case of the Casimir Effect with two metallic plates: there is a maximal size for the electromagnetic wavelengths between the plates (as they have to zero out where they touch the metal). The notion of wave is more general than the notion of eigenstate (Dirac pushed, successfully, the notion of wave so far that it created space, Spinor Space, and Quantum Field Theory has done more of the same, extending the general mood of De Broglie-Dirac to ever fancier Lagrangians, energy expression guiding the waves according to De Broglie scheme). Historically, De Broglie suggested in 1923 (several publications to the French Academy of Science) that to each particle was associated a (relativistic) wave. De Broglie’s reasons were looked at by Einstein, who was impressed (few, aside from Einstein could understand what De Broglie said; actually De Broglie French jury thesis, which had two Nobel prizes, was so baffled by De Broglie’s thesis, that they sent it to Einstein, to ask him what he thought. Einstein replied with the greatest compliment he ever made to anyone: “De Broglie has started to lift the great veil,” etc…). Consider an empty space S. If the space S is made available to (classical) Boltzmann particles, S is progressively invaded by (classical) particles occupying ever more states. When the same space S is made available as part of a Quantum System, the situation is strikingly different. As Sean Carroll points out, the situation is immediately static, it provides an order (as Bohm insisted it did). The observation is not new: the De Broglie waves provided an immediate explanation of the stability of electronic waves around atoms (thus supporting Bohr’s “First, or Semi-Classical, Quantum Theory”. What’s a difference of a Quantum System with a classical system? The classical system evolves, from a given order, to one, more disordered. The Quantum system does not evolve through increasing disorder. Instead, the space S, once accessed, becomes not so much an initial condition, but a global order. The afore-mentioned Hilbert Space with its eigenstates is that implicit, or implicate (Bohm) order. 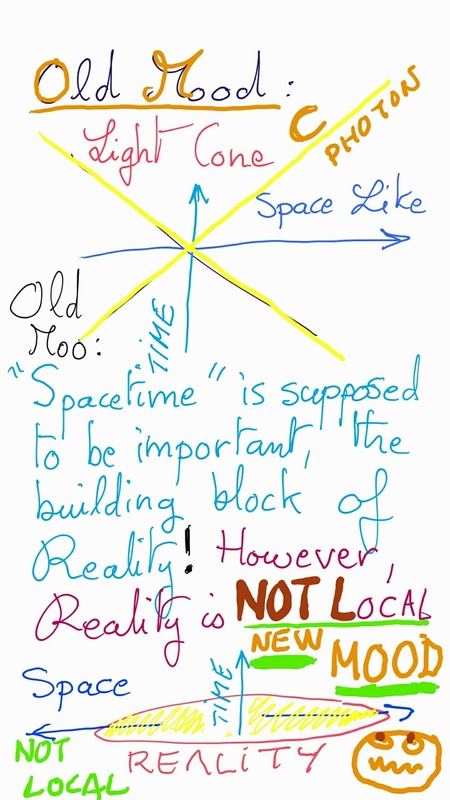 So the Quantum System is static in an important sense (from standing Quantum Waves, it sorts of vibrates through time). Thus Quantum Systems have an intrinsic time-assymmetry (at least when dealing with cavities). When there are no cavities, entanglement causes assymmetry: once an interaction has happened, until observation, there is entanglement. Before interaction, there was no entanglement. Two classical billiards balls are not entangled either before or after they interact, so the interaction by collision is fully time reversible. Entanglement is also something waves exhibit, once they have interacted and not before, which classical particles are deprived of. Once more we see the power of the Quantum mindset for explaining the world in a much more correct, much simpler, and thus much more powerful way. The Quantum even decides what time is. So far as we know, all the classical fundamental laws of physics, such as Newton’s equations, are reversible. Then were does irreversibility come from? It does NOT come, as was previously suggested, from order going to disorder. Quite the opposite: irreversibility comes from disorder (several waves)going to order (one wave, ordered by its surrounding geometry). And we do understand the origin of the order: it’s the implicit order of Quantum Waves deployed. You want to know the world? Let me introduce you to the Quantum, a concept of wealth, taste and intelligence. Last and not least: if I am right, the Quantum brings the spontaneous apparition of order, the exact opposite picture which has constituted the manger in which the great cows of physics have found their sustenance. Hence the fact that life and many other complicated naturally occurring physical systems are observed to create order in the universe are not so baffling anymore. Yes, they violate the Second Law of Thermodynamics. However, fundamentally, that violated the spirit, the principle of the universe, the Quantum itself.